I’m *SO* excited to announce my first giveaway! I had hoped to get this post up before midnight, but trust me – I really tried, folks! Still, free is always on time, right?! Over the weekend, my Life’s a Batch Facebook Page hit a very milestone – 500 ‘likes’. I was jazzed when I noticed, having been waiting for the special number to time my first giveaway. After all, my friends & fans are the “apples of my eye,” and I wouldn’t be here without your support & encouragement! So let’s get down to it, shall we? I personally LOVE the enameled cookie cutters when I find them. They clean up so well, and they don’t rust like so many tin ones do so easily. I scooped it right up, and I couldn’t wait to come home and make apple cookie favors for my boys’ teachers as Back-to-School gifts! When we arrived home a few days later, I set to putting my new cutters away… only to find I already had the same cookie cutter! The only acceptable thing to do is give it away, right? Right. 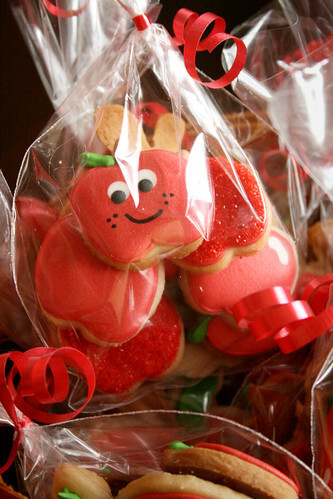 That way, YOU can share cute apple cookie favors with the special people in YOUR life, too! But that’s not enough, is it? Yeah, I don’t think so either. I wanted to sweeten the deal just a little bit more. Nothing is quite so sweet as mini apple cookie favors! I made a series of mini apple cookies to accompany the larger apple cookies, including traditional, sugared, and ADORABLE little apple dudes! 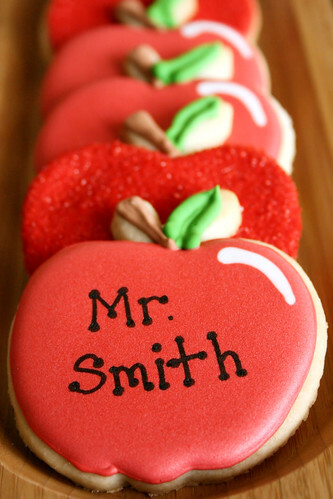 Now, for my boys’ teachers, I made sweet favor bags with one large “name” apple cookie & a handful of assorted mini apples. They turned out so cute, and I know *I* would welcome a treat of apple cookies on *my* desk ANY time! Oh, but let me be Eve & tempt you just a tiny bit more! Is that okay? I knew it would be. How ’bout them apples?! Gala, Red Delicious, and hand-picked Crab Apples I pulled from the side of the road this afternoon. Mmmm, right? Almost as American as apple pie… or at least an “Apple Dessert Shooter.” You can get one of these luscious treats at Applebee’s, and I want to give YOU a $25 gift card, too! So let’s recap, okay? 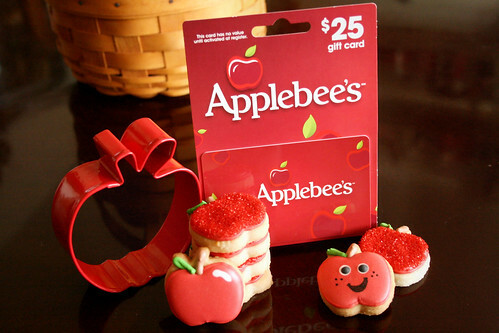 The winner of this giveaway will receive the following: one dozen (12) assorted mini apple cookies (individually wrapped), two (2) large apple cookie favors (one regular, one sugared), one enameled apple cookie cutter, and a $25 gift card to Applebee’s. Mandatory: For a chance to win, leave a comment on this entry telling me your FAVORITE kind of apple. Mine? I love a juicy, sweet Pink Lady, but I will settle for Gala apples during the off-season. Everyone’s got a favorite, and I want to hear YOURS. Tart, sweet, crisp, soft – if I offered you an apple in the Garden of Eden, what kind would be the one to make you fall? Leave a new comment for each entry, up to a total of four entries. ALL entries will be verified before a winner is chosen. Be sure to leave your email address with each comment, as I need to be able to contact you if you’re the winning entry! I will use Random.org to generate a winner at 9:00am CST on Thursday, September 1st. You will have 48 hours to respond to my email if you are the winner, or I will draw a second-chance winner & you will forfeit your prizes. Thanks for reading, and GOOD LUCK! « Easy & Breezy Dinner! What an awesome idea! I just love your creativity. My favorite apple is Honeycrisp! I love a good Gala apple. Sweet in season, tart when not. Delish! Congrats Nicole! I will go for a granny smith in most cases. Hi Nicole. I just found your cute blog. Wow, what a generous giveaway. I guess I’m not an apple connisoure (even though I like them) because I always choose Red Delicious. I like sweet over tart and am familiar with Granny Smith but that’s about it. And I love Applebees. I can’t believe you made that beautiful cookies. They’re almost too pretty to eat but I’d give it one heck of a try. Nicole I tried to follow you on twitter but it kept coming up blank. My twitter id is tracysuz. If you’d like to follow me, I’ll try to link up by following you back. I’m also your newest email subscriber. gala!!!!! I am excited to be your FB friend… You have many great ideas!!!!!!!! I love red delicious apples. I know a lot of people who don’t, but I do! i love granny smiths but you said Eden…….put that little darlin in some carmel ! My favorite is honeycrisp, but I usually settle for red delicious. We eat Gala apples the most! I love a good crisp fuji apple-especially sliced up with some sharp cheddar cheese! And… I already like you on FB. I love honeycrisp apples – they’re the only ones I’ll actually eat! I “like” you on facebook, too! And I just tweeted but am not sure how to give you the link for it. Hmm! Ohwell, I tried. I have to go with Granny Smith Apples! Apparently Honeycrisp are popular! They are my favorite too! I’ve been following you on Facebook! What an awesome idea! I love Red Delicious Apples; so sweet and juicy! And I’m now following you on Twitter! Honeycrisp apples are the best. Plain, with peanut butter with cheese love them. My favorite is Gala apples. Not too tart, not too sweet. They’re just perfect!! I’m already a FB follower!! Honeycrisp!! They’re sweet and a little tart and super crispy! Love, love, LOVE Granny Smith! And I follow you on both FB and Twitter. I’ll tweet this now from my @prosodic account. I’m not entering the give-away Nicole and I hope my comment doesn’t mess up the draw. If it does, just delete it. Just wanted to congratulate you on this follower’s milestone and tell you how adorable your cookies are. The kids are going to be proud as peacocks delivering the gifts to their teachers and the teachers are going to be delighted. Great give-away! Continue success with your blog and Facebook. Oh…just in time for my birthday! I LOVE granny smith, those are my favorite! I also love fuji apples. Absolute favorite: Pink Lady. But I can’t eat them all the time and they do not taste good with peanut butter. :p For just grabbing an apple any old time I prefer Fujis. I LOVE Golden Delicious! I have never understood why people think of red when they see apples. The yellow ones are the best! I live in Sonoma County, California, which is one hour north of San Francisco. This area use to be known for its apple orchards before the vineyards sprung up everywhere. This region was famous for its very sweet & delicious Gravenstein apples. I have 2 very old Gravenstein apple trees on my property that are left over from when it was an apple orchard. The apples don’t last long, so when they finally do ripen, we consume them fast. These are ABSOLUTELY my favorite apple and I’m lucky to be the protector of these two grand trees! PS — Congrats on 500 followers and you have amazing talent! What a great giveaway Nicole! Those sugared apples are beautiful. My favorites are Granny Smith. Congratulations on the 500 likes, your cookies are amazing! My favorite apple is a Honeycrisp, no other apple can come close for me and we are lucky enough to have an orchard nearby that supposedly grows them so we will be going apple picking this Fall! We love honeycrisps so much that we eat no other apples! Puts a damper on the apple consumption because honeycrisps are only available for a couple of months out of the year! I already follow you on FB…and I’ll get you on twitter as well! I love Braeburn apples! However, I recently made a delicious apple pie from not-quite-ripe apples I picked off a tree while riding my bicycle with the kids near post here in Heidelberg. Yummy! I love Honeycrisp apples!! They are the best. I don’t want to win, but since I love HoneyCrisp apples so much, I had to let you know!! Oh ya, and those crabapples are friggen’ adorable! Gala but only when they are in season and fresh from colorado! My favorite apples are Prime Reds that we pick at Maskars Orchard in Warwick, NY. After those, it would be Granny Smith, Pink Lady, Honeycrisp…love apples. I like caramel apples with nuts!!! I grew up in apple country – upstate New York. My very favorite apple of all is a Cortland, followed next by an MacIntosh. So yummy! that’s my kind of an apple a day! YUM YUM. love them. I think my fav would be pink lady also… I LOVE sweets and I find these are great! I just “liked” you on Facebook! And I realized that you live at Minot AFB, I lived there from 79-83!!! Small world! I am a fan on FB! Your work is wonderful!! Thank you so much for doing this giveaway! FUJI apples are far and away the best apples on the planet. Never mushy, always crisp, always juicy, always delicious. Yumm-o! Granny Smith are my fav! I love their color and tartness. I just followed you on twitter. My twitter name is birdwatcherok. Fuji. Anything crisp, sweet, and juicy. I just tweeted about your giveaway – my name is birdwatcherok. Oh, that cutter is adorable! My favorite is Granny Smith, but we’ve been eating tons of Gala lately. Thank you!! 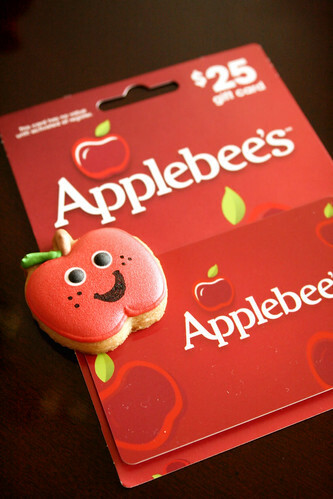 Love the Applebee’s card with the apple cookies — what a great idea! I love your site!!! So cute and creative!!! My favorite apple has to be Honeycrisp. My 6yr old daughter loves them too, she will grab an apple from the basket on our counter and ask if it’s the crunchy honeycrisp ones! Nothing like a sweet crisp apple to make your day! I love a Fuji apple… all day everyday.. throw some chocolate in it… perfect treat!!!!! My favorite apples have to be red delicious. I love how every time you taste them, they feel just like a crisp fall day. the red delicious are the ones that I wait to go picking for and that signifies that fall has begun.congratulations on your 500th like! Yay for apples and for fall not too far away! Two of my favorites! I love Fiji apples to just eat. Besides being sweet, but not too sweet, they are also consistently crisp. I like my apples to be very crisp! To cook with, my favorite are Johnathan or Braeburn as they are not so sweet and they don’t get so mushy when they are cooked. I love a nice Braeburn,I am a facebook fan,and I follow you on twitter too. I love browsing your cookies as they are all so yummy . I am now following you on Twitter!!!! I have been a fan of your facebook page for awhile…LOVE it!!! Does a Candy Apple count? That’s my favorite. I LOVE all apples, but I would have to say my favorite type is a Gala apple. Fresh apple pie in the fall…. YUM The more varieties of apples that you use, the richer the blend of flavors and sweetness. Always choose a Macintosh for a crisp sweet bite! I love granny smith apples!!! I wish I knew the kind they are called, but growing up my friend Kyle’s family had an apple tree farm and they would grow the biggest apples I’ve ever seen, and the BEST! they were the size of a cereal bowl! <3 I want apples nowwww!!! 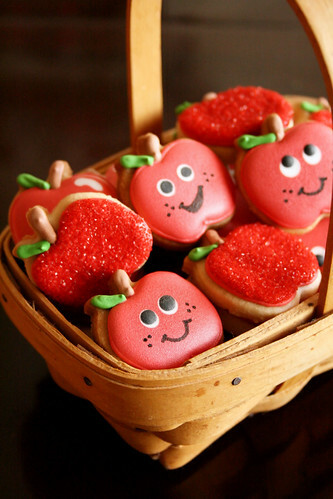 your little apple cookies are adorable!!! I love Honeycrisp! Thank you for the giveaway! Love me some Granny Smiths!!! What an awesome and fun give away! In our house we love Granny Smith Apples. Gala apples.. One a day!! I just became a FB follower! Granny Smith Apples! They make the best apple pie! I LOVE green crispy and tart apples! I also love them with peanut butter and a little sugar! YUM! Thank you for the giveaway! Love your cookies! 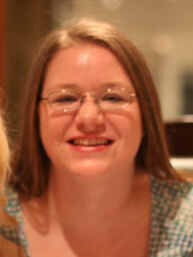 I am now a facebook fan of yours! My favorite apples are the pink lady, but I like fujis and Granny Smith, too. I go once a year to Los Rios Rancho in Oak Glen, CA to buy apples, fresh pressed apple cider, apple pie and apple crisp. Love me some Granny Smith apples! Honeycrisp apples! I can’t wait for them to be in season! They are the best! Oooooh, cameo & pinata! Two new types of apples I’ve never even HEARD of before! I swear, I’m learning so very many new things today! Pink Ladys are definitely my favorite!!!!!! 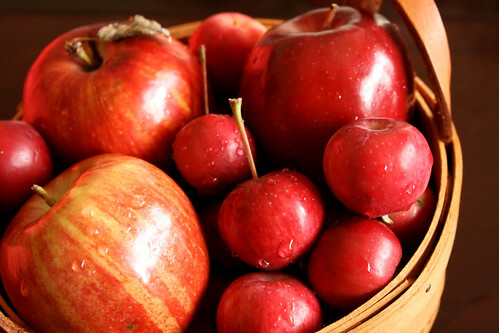 My favorite apple is definitely the Red Delicious…yum!!! Fuji Apples are my favorite! I have “liked” you on Facebook for awhile! You are so talented!! love a Gala to snack on but Granny Smiths to bake with! McIntosh are my favorite. When my oldest daughter was 4 years old she “wrote” her first (and only) recipe that we still make occasionally by drawing a picture on a 3×5 piece of paper of Mom, an apple and some scribbles meaning “cinnamon sugar” It is simply the best! 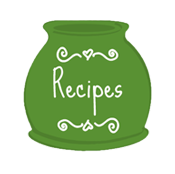 “recipe.” Thank you for sharing it with me! Gala are delicious, but I love any apple really! Like you on FB with my personal page and my fan page! I love some green Granny Smith apples! Yum!!! HONEY CRISP is at the top of the list, but my palate anxiously awaits a new crop of SWEET TANGO – a combination of the Honeycrisp and Zestar apples. The trees are finally maturing to the point they can produce enough to sell the ST nationally this September (it’s an early apple). Here in Michigan apple picking is a favorite past time for many every Autumn. I retweeted about your give away…. thats 3 counts Yay! I love Macoun apples, but Mcintosh are a close second! I “liked” your page on FB! Lately I like fuji apples. Super cold honeycrisps are my all time favorite. Granny Smiths are my are my fav for baking. I pretty much love them all. My fav is GALA! !….but I like them all!! I LOVE golden apples!! Yummy!!! I’ve been following you on facebook for a while now. I love the apple cookies! I just bought some jars to put some mini apple cookies in for my principal (I teach) and the two secretaries that work at my school – and another one for a friend of mine who is a principal at another school. 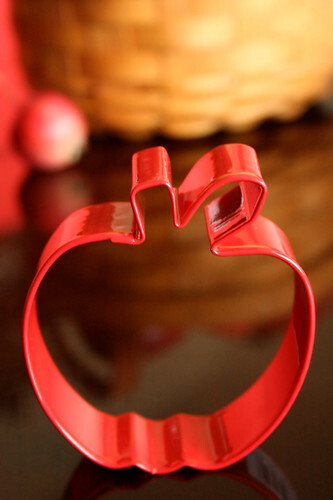 I just don’t have the mini apple cookie cutter yet! 8)~ I’ve got to get one soon. It would be neat to win this one! I adore Macintosh apples. Loooove! I have been following you on FB since the beginning! I love a nice, crisp Granny Smith (cold from the fridge)! They are so yummy dipped in caramel sauce, melted chocolate, or peanut butter! I like Gala apples! Thanks for the awesome giveaway! Favorite apple: these days, I’m preferring Honeycrisp. I have, in fact, “liked” you on Facebook. Pink Lady!!!! Following on Facebook too! I LOVE Gala apples…even though all apples make my throat itch! Well – you know I believe in you girl! I’ve done it all – FB, Twitter, Comment – did it again…and as always will continue to support you! Great posting! Love the pictures! 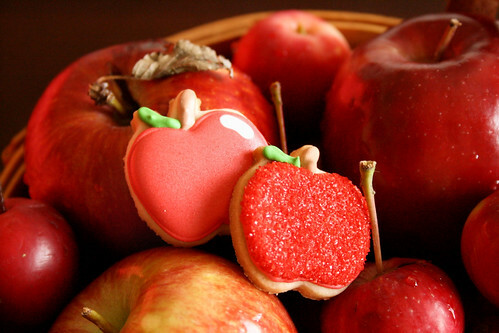 And the apple cookies are so cute! Well I like honey crisp! Love Gala and Honey Crisp for eating and just canned my applesauce with Paula Reds! 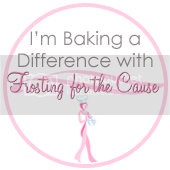 Love the cookies & the site! For snacking, absolutely the gala. pink lady is a good choice too though! 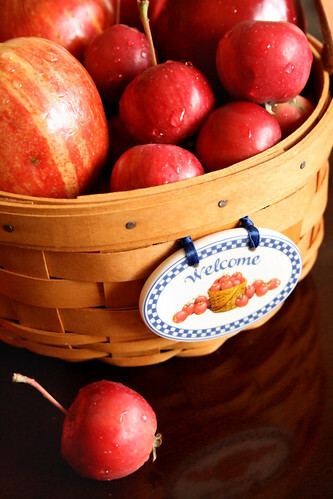 My favorite is the Honey Crisp Apple – a sweet mix with cool crisp “snap” when you eat it…yum, yum! As always, love the innovative cookie designs you share – these are by far the best cookies on the planet… no bias, even if I am your MOM. Braeburn is my favorite apple. I already “like” the facebook page. It’s amazing! Fuji apples! I would love these for my sister who is a teacher! Fuji! I am following you on Twitter. I “like” you on Facebook and have linked you on my page. And now you have been re-tweeted too! I think I like Jonathons the best — sadly you hardly find them anymore. Love your cookies — wish I tweeted but I’m going to try and share the giveaway on facebook! Love, love, love Macintosh and Gala. I know, I am crazy, but I don’t like apples. However, my son LOVES Granny Smith! Love your blog AND Gala apples!!! AN APPLE A DAY!!! BETTER YET A COOKIE!! I am following you on Twitter, but I’m a twitter loser and don’t really tweet. I love Gala, although I’ve never had a Pink Lady…I bet I would like those! I have been a fan of your Facebook page for a while now, as well. Red delisious are my absolute favorite! Granny Smith dipped in carmel!! mm mm! Gala!! too many good ones though! I lovelove love Honey Crisp apples. They’re so expensive, so my next favorite is the Empire apple. I like your FB too. Every now and then, I love a golden delicious, but there is nothing like a tart Granny Smith! I “LIKE” you on Facebook and will certainly refer everyone to you! I’m not sure if it’s a ‘new’ kinda apple but it is delicious… it’s called Ginger Gold. Looks like a Yellow Delicious apple but tastes more yummier! My favorite apple is the granny smith apple, my birthday is in october and we always go to the apple orchard and pick these around my birthday. nothing says more than fall than a granny smith with a caramel sauce!!! I love this page! So many awesome ideas. I would so love to win the prize pack but if I don’t just getting to see these awesome cookies are great too!!! Cortland for baking. These are so adorable and would be perfect for my sons apple picking birthday! Love the apple cookies. And would love to make for our church bake sale. My favorite apple is good ol’ Yellow Delicious which we have our own tree in the backyard and my second is Honey crisp!